Asheville folks are enthusiastic CSA supporters. By joining a CSA—which stands for “Community Supported Agriculture”—you become a partner with the farmer. In early Spring, CSA members pay for their membership in advance. This provides capital for the farmer to buy seed, plant, and cultivate their crops. Then in mid-May, when the garden begins producing, CSA members reap the benefit by receiving a weekly box of everything that’s in season, right into Fall. And sometimes there’s more than produce! In addition to vegetables, fruits, and wild harvest, our Randall Cove Farm CSA provides artisan breads, free range eggs, and handmade cheeses. 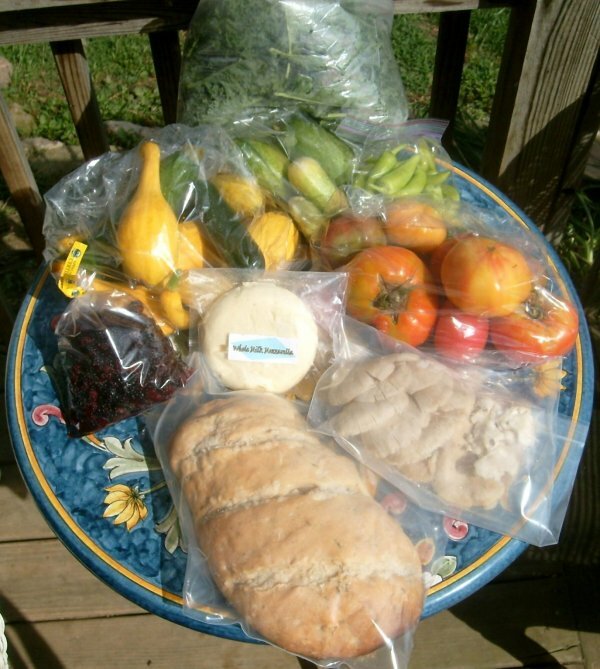 This midsummer CSA box features yellow squash, zucchini, heirloom tomatoes, banana peppers, kale, cucumbers, wild oyster mushrooms, wild blackberries, whole milk mozzarella, and fresh herb bread.